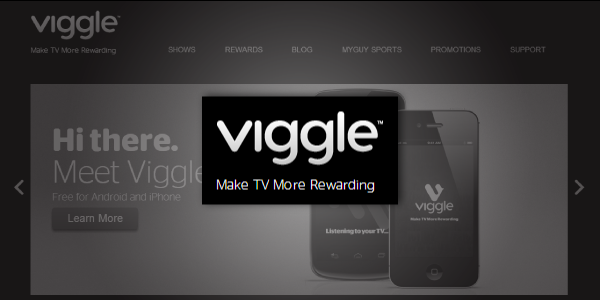 Viggle is a smart phone app that can be used to earn points for watching television shows. The points can be redeemed for gift cards and other prizes. You may have seen the many Viggle commercials where the guy talks about how you earn rewards watching TV, while people randomly hand him prizes like headphones or a cruise vacation out of a TV screen. Once you download the app from either Apple’s App Store or Android’s Play Store, you can check in each time you are watching television. The app can determine what show you are watching by listening briefly through your phone’s speaker system. Once you are checked in, you earn one point per minute of viewing time. Some have reported not finishing shows and still getting all the points anyway. Let us know what your experience is with that, but be careful not to do this too much and risk having your Viggle account suspended. How quickly can I earn prizes? While it varies from prize to prize, it appears that most prizes cost several thousand points. Therefore, how quickly you earn prizes depends on how much time you spend watching television and the specific prizes you redeem. Is checking in the only way to earn points? Nope. You can “play along” with some shows and earn bonus points. Also, Viggle has a partnership with DirectTV, so their customers can sometimes earn even more bonus points. You do not have to be a DirectTV customer to use the app however. I just recently downloaded the app and cannot answer a lot of questions from experience. In addition, we often hook our computer up to our television and stream shows from the network websites such as USA and ABC Family. I have read where users were able to check in watching shows on Hulu, but they also noted that Netflix was iffy. Viggle says that it works with live or pre-recorded shows. I take that to mean DVR should work, and I didn’t find where anyone seemed to have trouble with that. This morning I was successful checking in to a show on live television and to last week’s episode of “The Secret Life of an American Teenager” on abcfamily.com. I will update as I learn more about what works and what doesn’t. Lastly, they do state on their website that they will suspend accounts for suspicious activity (i.e. too many check-ins in a short period of time, like you wouldn’t have time to watch that many shows in that amount of time ever.) They also regulate to one account per person. What has your experience been with Viggle? I’ve been using this app since january and i think as long as the show was on tv it picks it up. I watched Nip/Tuck on netflix and it worked just fine. My brother watches games that arent on TV on the computer and it knows what he’s watching. I think the only thing is that you can’t play with Viggle and that gives you the opportunity to earn more points as you are watching it live. I have been using Viggle almost since it came out. I have redeemed it for many $5 CVS gift cards (great for getting free soda) and several $25 Lowe’s gift cards. I live in a small town so I can’t really use the Best Buy or other cards offered because I would have to pay shipping. What you have to remember is that Viggle is a DirecTV sponsored app. I have DirecTV and there’s a 4,000 bonus just for linking your DirecTV account to the app. There are also bonuses for certain shows that are offered only to DirecTV subscribers. The app is geared to work around DirecTV programming also, so if your show isn’t being recognized, it’s because it’s not been shown on DirecTV in the last few days. Just tried to redeem my Lowes gift card (3 FOR 25.00 each). They refused saying it was a scam. Said if the certificate does Lowe say lowes.com at the bottom they will not take. don’t think i am PISSED. I love Viggle, especially when you can get 2x or even some shows have 10x the points. Now, you can even check in to music and that does work. I tried it when a song came on the radio and earned 25-points just for “checking in”. Hey, 25-points for a 3-4 minute song…awesome! Can get more points that way. Anywho, it’s a great app. I’ve redeemed points for a couple things. One was for a free Redbox movie. Well, sort of free, I upgraded to Blu-Ray and had to pay about $.50 more. I also redeemed points for a $5 ecard for Barnes ‘n Noble. I’m just letting my points rack up now and see what happens. I should’ve said for the Blu-Ray, that I had to pay about $.50 out of pocket. The free Redbox movie is for a regular DVD. I don’t think I’m breaking the bank on that one.